A few years ago my friend, Ann, brought me a bouquet of Mexican sunflowers as a surprise. In their overblown lushness they are the my garden’s equivalent of Betty Boop flowers. 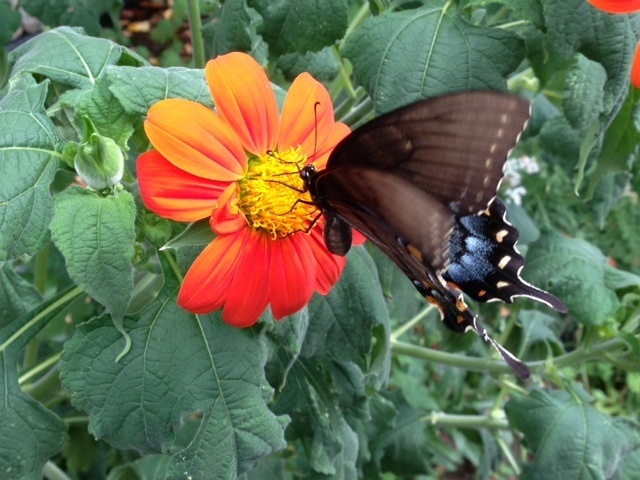 This morning a butterfly went from flower to flower doing the work of pollination. After a few minutes the bee arrived and took up the task. I thought back to something my friend, Chris, had shared with me. I had been invited to serve on a Board by a nonprofit agency. It was a busy time–when isn’t a busy time–and I was telling him how frustrated I was because I had to take on one more thing. That’s when Chris quietly said, “You should give someone else the opportunity. What is a burden for you is an opportunity for them.” And he was right. I had been focusing on myself, not on what would be best for agency Board or on how another individual could happily bring their talents to the table. What could be burdensome for me was an opportunity for someone else. I didn’t join that Board and somehow they managed just fine, perhaps even better, without me. Someone else served instead. 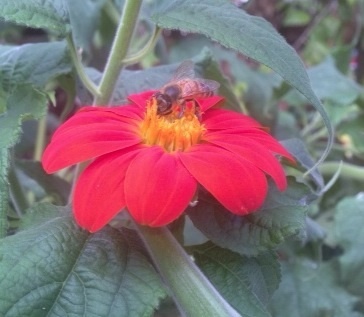 The bee can pollinate the sunflowers as well as the butterfly. It is only a matter of sharing opportunity.